Typically, this condition clears up in a week or two, as soon as the temperatures rise enough for the beneficial bacteria to colonizine in the rocks and the biological filter. Spiking the pond with an application of bacteria is a good idea at this time of year to help get it started. The rising temperatures will not only help start the production of bacteria in the filter, but it will also break the plants’ dormancy. As the plants begin actively growing, they help consume some of the excess nutrients and compete with the algae thereby reducing its growth. Many people have had great success with some form of biological products which forces the strands of string algae to take in excess calcium from the surrounding water. When the algae absorb this calcium, the strands break off, floating to the surface. Once they separate, they will either go into the skimmer, or be easily weeded out by hand. Although it doesn't completely eradicate string algae, it reduces the bloom to an acceptable level. 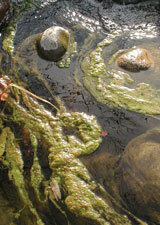 After all, some string algae are actually healthy for a pond. Rocks and Gravel: When rocks and gravel are added to a pond, bacteria will actually colonize in the gaps and crevices between the rocks. The rocks and gravel provide huge amounts of surface area for the bacteria to colonize and multiply. Once the bacteria colonize the rocks, it’s just like having an additional biological filter in your pond. Biological Filtration: Having the proper size of biological filter is essential if you want clean, clear water. Without a biological filter, you are facing a losing battle against green water. Aquascape’s BioFalls® Filter provides a huge area for bacteria and enzymes to colonize. These bacteria and enzymes consume nutrients and help break down organic debris and fish wastes that would otherwise contribute to water quality problems. Another important factor to guard against is the use of any chemicals or nutrients entering the pond from outside sources. There are several ways that nutrients find their way into the pond. The two most common come from storm water runoff and lawn fertilizer. Storm water runoff that’s allowed to enter the pond will quickly add loads of new nutrients to the ecosystem. Lawn fertilizers accidentally sprayed into the pond can quickly turn the clearest pond green. Avoid having adjacent lawns chemically sprayed or treated. More often than not this creates problems in the pond. Adding additional bacteria to the pond often controls algae. Bacteria feed on the same nutrients that algae does. And adding nitrifying bacteria will help win the war against green water. Nitrifying bacteria converts harmful fish wastes into nitrite, and eventually into nitrates, which plants use as nutrition/fertilizer. The bacteria colonize on the filter mats and lava rock in the biological filter, as well as on the rocks and gravel in the pond. This, all by itself, will help the water stay clear.